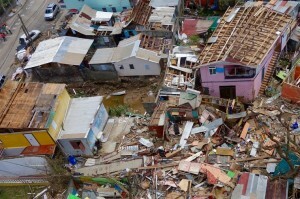 NEW YORK - A United Nations disaster assessment official visiting hurricane-battered Dominica says an estimated 60,000 to 65,000 people, or 80 per cent of the total population, have been affected and food and clean water are the most immediate needs. “There is a big, big urgency to get water and food,” said Sergio Da Silva, UN Disaster Assessment and Coordination (UNDAC) team leader, who spoke to reporters in New York by phone from the ground yesterday, adding that inaccessibility to remote areas has made it difficult to ascertain just how many people have been affected. Maria made landfall on the tiny island of 72,000 people late on September 18, with maximum sustained winds of nearly 160 miles per hour. Silva, who has been in Dominica since last Thursday, assisting in the coordination of incoming international relief, said shelter is also a priority. Delivering humanitarian aid to remote villages remains a huge challenge as many roads were destroyed.